Many home cleaning tips that used to be common knowledge – such as vinegar for killing molds, lemon juice for bleaching (or mix with cream of tartar to rub on stains and hang in the sun- white clothes only) – are now largely forgotten, as we have learned to depend on multi-national corporations to tell us what to buy for the convenience of not having to think ourselves. Shower doors are not only an elegant design element, but an excellent way to keep unwanted water leaks splashing out of the shower stall area. However, keeping shower doors in perfect condition requires regular maintenance and cleaning. Water marks, soap and dirt scum, mineral buildups, mildew and mold look revolting and are potentially dangerous for health. Cleaning shower doors can be a frustrating experience, especially if you don’t know which cleaning products to use and how to use them. 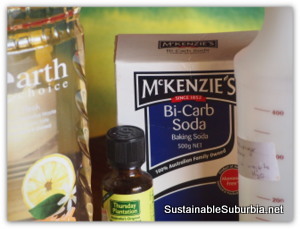 There are many ecologically-friendly alternatives to standard cleaning products. They are inexpensive and safe for you, your family and the environment. Chemical detergents and cleaners can be substituted with natural soap tree solution, white distilled vinegar, lemon juice, salt, baking soda and tea tree oil. Distilled white vinegar successfully removes nearly all types of shower doors dirt, as well as killing mold spores. In addition, it is excellent for removing unpleasant bathroom odors. Typically, a mixture of vinegar and water in 1:2 ratio is used; however if you are dealing with stubborn stains or cleaning shower doors that are very dirty, a full-strength white vinegar is recommended. Spray it directly onto the doors, scrub the areas with a microfiber cloth and rinse well with warm water. Mineral buildups and soap scum can be easily removed with a mixture of vinegar and baking soda. Apply it over the problematic area and rub well with a damp cloth. Undiluted white vinegar is perfect for cleaning shower door tracks too. Pour it directly into the tracks, leave for half an hour and scrub the area with an old toothbrush. Tea tree oil and lemon juice have strong antibacterial properties and this is why both substances are recommended for eco-friendly bathroom sanitation. Mix two teaspoons of tea tree oil with a teaspoon of salt and dissolve the mixture into two cups of water. Use the solution directly on the contaminated areas. Tea tree oil not only kills a wide range of bacteria, molds and mildew and prevents their recurrence, but has a fresh pleasant scent. You might also like to read my post on how to clean a shower with no nasties.